Live background music can add enormously to the atmosphere of an event - giving a sense of occasion or helping to create an appropriate ambiance. However, it is important that the band is not so loud that it inhibits conversation. The object is to encourage people to linger, find out about the organisation or make deals and purchases. We are efficient and professional. We can set up quickly and are flexible about where we are positioned, as we do not generally require access to a power supply. Our extensive easy-listening repertoire includes something for almost all musical tastes. We sometimes provide themed selections e.g. plants and flowers; Scottish, etc. We have a reputation for liaising effectively with event organisers so that the occasion runs smoothly. Finally, the trio is sufficiently unusual that it will make your event distinctive. Every event is different and the fee will depend on your exact requirements. However, prices generally fall within the range £250 - £500. Contact us with details of the date, venue and what you have in mind. We will be back in touch as soon as possible to give you a more specific figure. 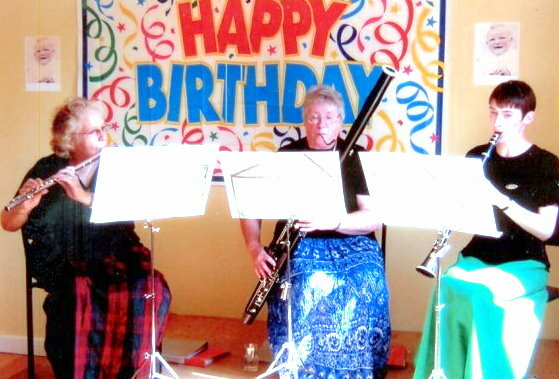 Live background music can be an ideal choice if you are celebrating a landmark birthday or wedding anniversary. 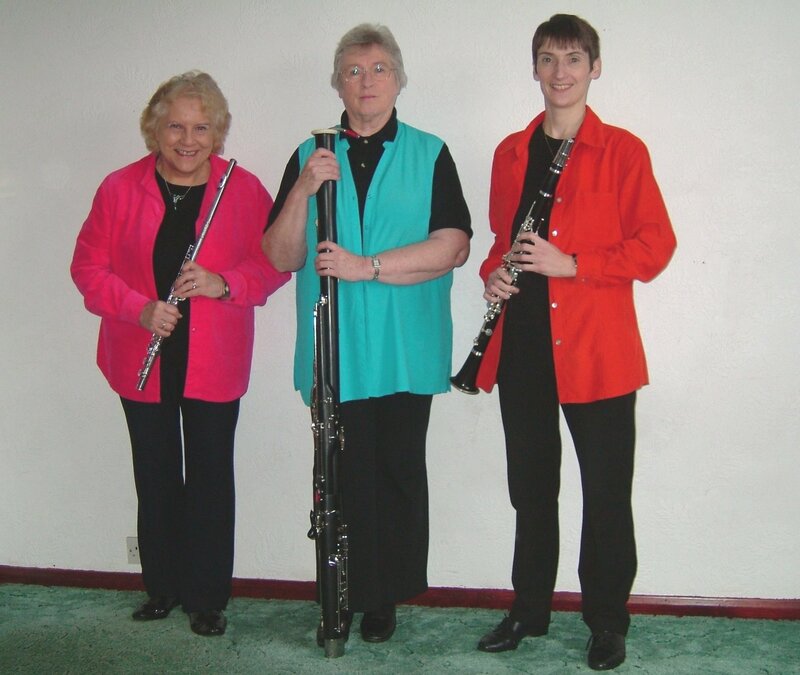 A group like the Faucheldean Wind Trio provides entertainment for everyone present, giving a 'sense of occasion' without being so loud that it is difficult to converse comfortably. We are particularly appropriate for daytime events or evening functions with a high proportion of older guests, who may not feel fit to dance the night away! We are efficient, friendly and approachable. The three different woodwind instruments are interesting to look at, as well as providing a charming and unusual listening experience. Our extensive easy-listening repertoire includes something for almost all musical tastes. We can provide a classical or all-Scottish programme on request, but we generally find that audiences appreciate a variety of styles. We have a reputation for liaising effectively with event organisers so that the occasion runs as smoothly as possible.